The Shetland Islands are the northernmost part of Britain, located northeast of the Orkney Islands and Scottish mainland. Similar to other locations in northwest Europe, during the Neolithic Period (4000-2500 cal BC) suitable lithic sources were exploited for use in the production of stone axes and other artefacts (Bergsvik 2006; Ballin 2009; Cooney 2005). The empirical standard used throughout these experiments was falsifiability and accordingly, potential falsifiers were identified from a list of basic statements relating to each theory and then tested. It was crucial that all results were consistent with the primary material and repeatable. 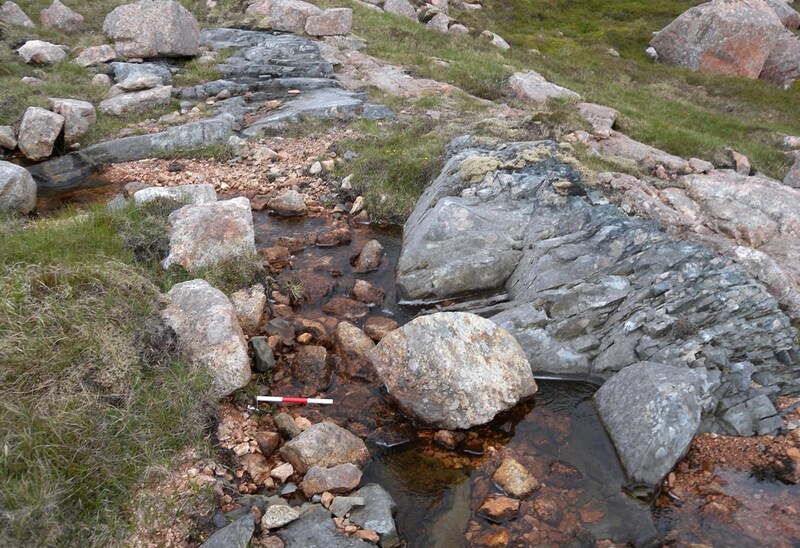 In Shetland the main material of choice was felsite, which presents as distinct grey/blue coloured dyke intrusions (See Figure 1), contrasting sharply against the typically red granite bedrock. 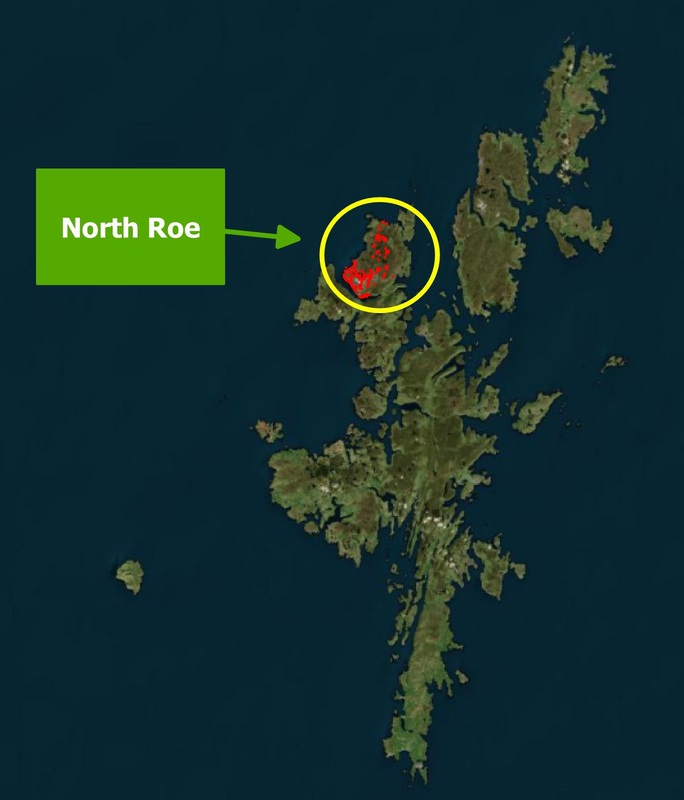 The majority of dykes and the associated quarries are found across the North Roe peninsula on mainland Shetland, range in width from approximately 0.5 metres to 4 metres and are oriented roughly north/south. The majority of evidence for felsite tool production comes from the quarry sites themselves, whereas potential indications of their function come from a small number of caches/hoard finds and settlement excavations. While material from the island has found its way into various museum collections outside Shetland, there is no evidence for any movement of materials off the islands during the Neolithic, contrasting sharply to neighbouring Orkney. Visually, finished felsite knives and axes, as well as raw unworked felsite, can vary considerably. 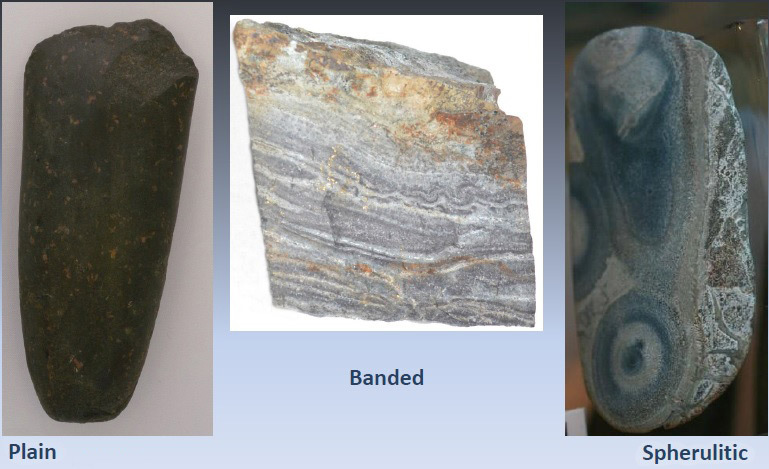 Simply, felsite can be divided into plain, banded and Spherulitic, this last type apparently being preferred for knife production over axe (See Figure 2). On the ground today quarry sites are typically identified by pits,representing the absences of an in situ dyke, which are surrounded by large amounts of broken and worked stone. At these sites there is evidence for different stages in the procurement and production sequence, including removal of "intact rock"(McGreevy and Whalley 1985, 338), removal of workable material from larger stones and the initial roughing out and deposition of broken attempts. From 2009 to 2012 small scale reconnaissance surveys were conducted in order to identify key sites in the North Roe area (Ballin 2011a; Ballin 2011b). One such site, known as Grut Wells (See Figure 3), has a series of quarries along the course of a single dyke with associated material scatterand was the focus of an intensive field survey in 2013. Running north/south along the dyke, the quarries are situated near the top of an east facing slope (See Figure 4) with large pieces of apparently worked stone scattered downslope to the east. To the west of the dyke, on a flatter part of the hill there are large amounts of small, finer worked flakes, possibly the remnants of individual knapping episodes. However, as the teams began the field survey, this once clear impression began to blur. The main problem stems from the fact that felsite is very susceptible to weathering and erosion. Firstly, the extreme wet, windy and cold climate of the North Sea subjects this stone to intense freeze-thaw action. Parallel frost cracking and pot-lid fracturing makes it difficult to identify with certainty worked from naturally broken material (See Figure 5). Essentially, the material collected during this field season can be seen on a spectrumfrom ‘definitely worked’ at one end to ‘definitely weathered’ at the other. The area between these two points, which constitutes the largest amount of material, is made up of pieces that so far cannot be definitively identified. Correspondingly, the primary objective of this experimental project will be to create reference collections of material, both naturally weathered and worked by humans in order to identify morphological discriminators of each. Once identified, these discriminators will be applied to collected material from the Grut Wells site in order to determine if the ‘unknown’ group can be further reduced. Following this, experiments will be designed to establish what morphological alterations occur in worked felsite following subsequent weathering. The second factor is an apparent leaching of minerals and subsequent weakening of the rock. Since the Neolithic period the area of North Roe has become covered in bog, resulting in a consequential build-up of humic acid. It is believed that this is having an effect on the stone on the ground, discolouring all stone including felsite. Indeed, initial results from portable x-ray fluorescence (PXRF) field testing have suggested that the effected felsite possessed less iron and potassium, which is consistent with organic acid leaching. 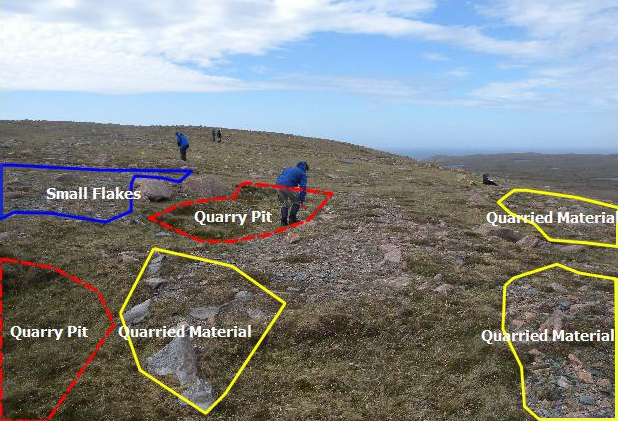 The basic methodological sequence of this experimental project was firstly to attempt to answer questions through a detailed analysis of primary materials, including quarry site waste and finished objects held in Lerwick Museum. Following this, secondary commentaries relating to each question were researched and compared against the primary material. This research resolved some issues however, where in cases where the collected primary material was insufficient and there was little secondary commentary additional data was required, which was sought through experimentation. This, unfortunately, still did not address our main question which was to identify morphological discriminators. To this end it was decided that an experimental collection of known worked material was needed. 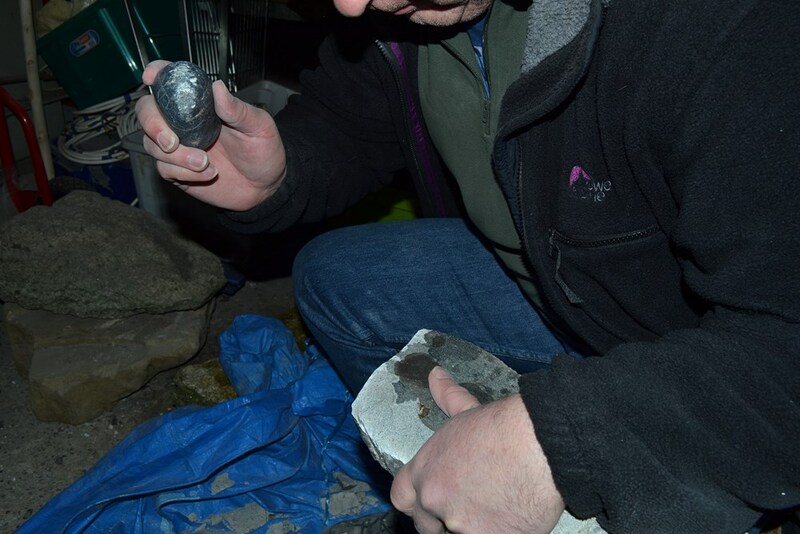 Following a period of research, mainly focusing on Torbin Balin’s comprehensive analysis of Shetland’s stone tools, a slightly revised production sequence was proposed that included the refining of rough-outs by means of soft hammer percussion (Ballin 2012, 2). Using raw material sourced from Shetlands specifically for this experimental work, a programme of axe replication began. 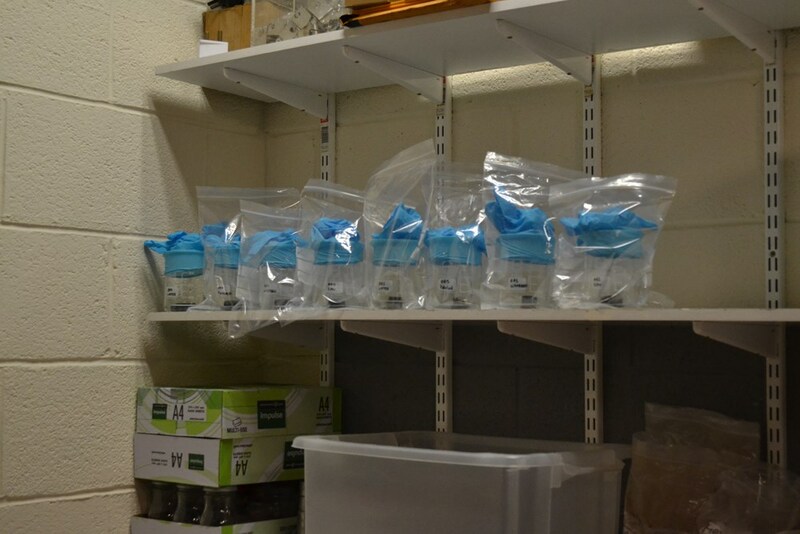 Each stage in the production sequence was conducted by experienced knappers, recorded, pictured and the resulting materials bagged (See Figure 6). The practical knapping aspect of this experiment has been concluded and it has now entered an analysis phase. Four samples of felsite have been worked using large hard hammers, small hard hammers, soft hammer and indirect percussion producing a wide range of reference flakes and debitage. These will now be strewed in their particular groups and examined to distinguish distinct morphological features. Once completed, archaeological material collected from the quarry sites during the 2013 survey season will be analysed with reference to these features. While the first experiment provides for the worked material, a different approach was needed in creating a reference collection of known weathered materials. This experiment sought to answer the other aspect of the main question and provide data relating to freeze-thaw action on the stone. The project's initial approach to this problem was to attempt an answer through secondary literary sources and published experimental work only. Unfortunately this proved to be of limited use. Firstly, relatively little work has been conducted on this topic (McGreevy and Whalley 1985,337; Hall 1980, 183) and any that has been undertaken is generally specific to particular questions and only partly applicable to other experiments. Also, while our experiments actively sought to accentuate and accelerate freeze-thaw to produce a reference collection, other experiments were concerned with “inferring natural rock weathering behavior” (McGreevy and Whalley 1985,345) and so methodological modification was needed. 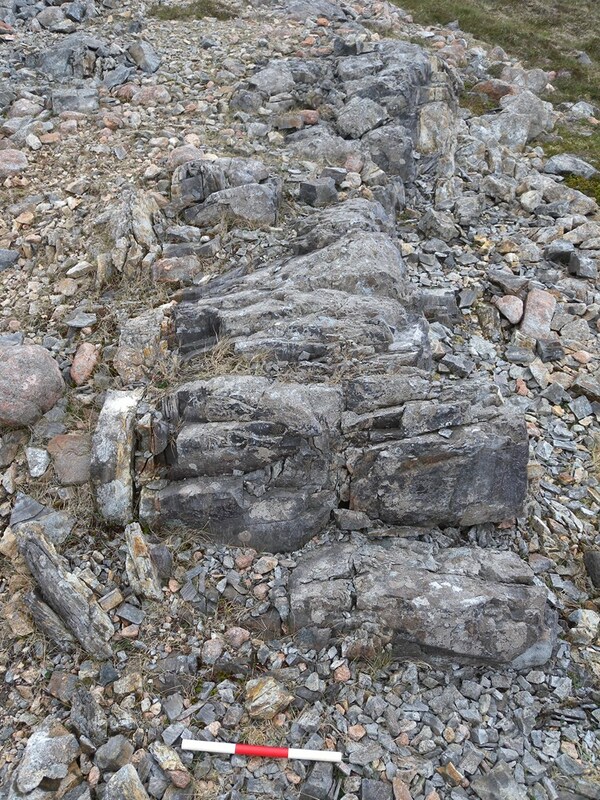 Lastly and most importantly, as each stone possesses its own unique properties, experiments would have to be conducted on Shetland felsite itself, which has not happened to date. As a result it was decided to run an independent freeze-thaw experiment specifically focused on felsite. The mechanics of freeze-thaw on stone are reliant on two elements; moisture content and temperatures that fluctuate above and below freezing. Moisture naturally absorbed by the stone can expand by 9% (Yavuz, et al. 2006, 767) when frozen, applying pressure. Once the tensile strength of the stone is reached fractures occurs, which over time become larger, ultimately detaching material from the parent rock. In the field felsite had been observed to produce both pot-lid fractures and parallel cracking resulting in tabular breaks. To saturate samples in water for a period of no longer than 24 hours (McGreevy and Whalley 1985:, 341)so as to avoid over saturation and unrealistic outcomes (McGreevy & Whalley 1985, 337). The saturated samples will be placed into dry basins and placed into a freezer at -6°C for a period of up to 24 hours. Due to “self-desiccation” (McGreevy and Whalley 1985, 341) a rock may lose as much as 7-15% of its water from saturation to freezing. The basin will simply ensure the collection of lost water. After this time, the sample will be thawed in 20°C water for a period of 6 hours (Saad, Gue´don and Martineau 2010, 200). As the ice thaws, the “saturation coefficient” (McGreevy and Whalley 1985, 338)of the stone will once again increase and the process will be repeated. This will be conducted over 25 times to ensure an appropriate level of cycles has been reached. In order to test the impact of specific elements within the experiment, unsaturated pieces of felsite are being placed into the freezer, while other saturated pieces are being exposed only to even temperatures above freezing. This experiment is also currently ongoing with the first cycle coming to an end soon. While cracking has appeared, there have been no removals of material from the parent rock. The initial attempt to answer this question began by consulting the geologists on the survey project. It was suggested that humic acid, a result of post-Neolithic bog development, was leaching minerals from the stone. PXRF analysis in the field suggested that both iron and potassium levels were lower in the pale material, which would also be consistent with humic acid leaching. To add to this picture, experimental and secondary commentary sources relating to this phenomenon were consulted, but this produced very little in terms of usable data. Consequently, it was decided to initiate an experimental programme to supply additional data. To this end, an experiment was designed that would subject different types of felsite (plain, banded and spherulitic) to an accelerated organic acidic reaction. The felsite samples were each cut into four similarly proportioned pieces. This provided enough material to run leaching tests on polished, unpolished and cleaned specimens while exposing a fourth sample to ordinary tap water as a neutral Ph control (See Figure 7). 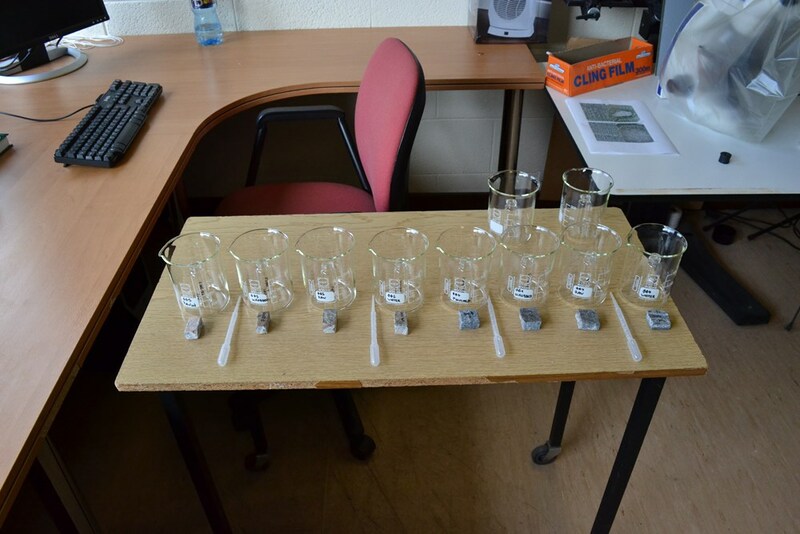 All sides of each sample were photographed and detailed notes were taken on the process before the samples were placed into individual beakers and half submerged in acetic acid (See Figure 8). Additionally, each leaching specimen had a corresponding control sample of either acetic acid or water to act as a control against which any later solutions can be compared. As humic acid is very weak, it was decided to use a more corrosive substance. As all organic acids share the same corrosive compound it was decided to use 99.85% acetic acid as it will serve to cause a faster reaction but not necessarily a different one. The specimens will be exposed to the acetic acid test for a period of six months, with a progress review after three months. Further, pictures will be taken every week and observations noted in a project notebook so that changes can be assessed as and when they occur. At the end of the experiment, there will be one of two outcomes. Either the acid will have begun to leach the stone or, if not, the experiment will be re-run with a stronger organic acid. If the former occurs, the resulting solution from each specimen beaker will then be subjected to additional testing to determine what minerals, if any, have been leeched. These tests will firstly consist of a simple reaction test to determine if iron and potassium, the predicted minerals, are present. Following this it will be desirable to have other samples of the solution subjected to atomic absorption testing to identify any additional elements contained within it. There will be a second survey in 2014 and it is hoped that most, if not all, of our experiments will have provided results that we can test in the field. At the very least, we wish to be in a position to assess the practical implementation of our established known worked and weathered morphological features. Additionally, this will give us an opportunity to source more raw materials for experimental purposes, the suitability of which can be guided by our experiences in knapping felsite since the summer of 2013. As a result of the first experiment we will have produced a number of roughouts. Some of these will be secondarily weathered so as to assess any effects of weathering on worked materials. Other roughouts will be progressed to a grinding phase for both experimental and outreach purposes. In terms of the former, this field season we wish to approach the question of suitable available materials for this crucial production phase. For the latter, it is intended for the project members to seek greater engagement from the community in the Shetlands by providing public talks, demonstrations of PXRF units and knapping sessions where replicated materials will also be displayed.